Mount Pancar is a rising destination in Bogor. 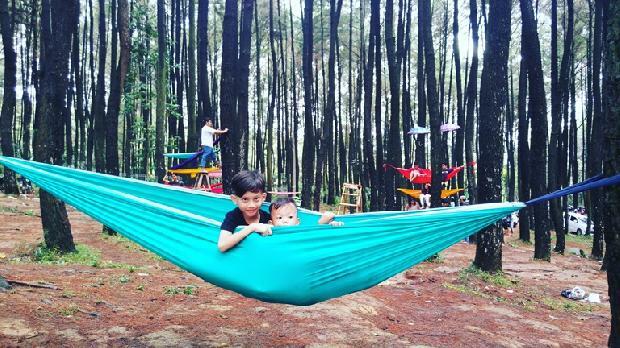 The beauty of its pine forest draws attention among instaholics. Mount Pancar is just one hour drive from Jakarta. So it is easy to reach and can be the perfect hideaway from the hustle and bustle of city. The admission is only Rp 5,000 for locals and Rp 100,000 for foreigner. Since Mount Pancar Tourism Park opens 24 hours, let’s find out various things to do in Mount Pancar. 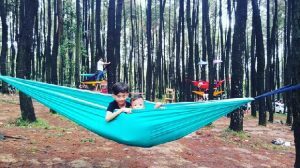 The pine forest on Mount Pancar is not only instagramable, but also offers the opportunity for visitors to spend the night in it. 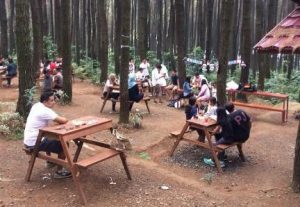 The operator of Mount Pancar Tourist Park provides camping ground equipped with adequate facilities. There are clean bathrooms, electricity, water, cleaning service and tent rental. 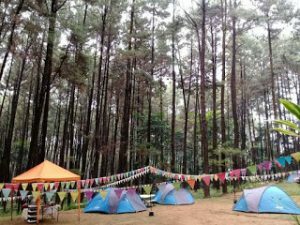 The cost for camping is Rp 80,000 per person. While the cost of renting a tent is Rp 250,000. No need to worry if you can not set up a tent. There are officers from Mount Pancar Tourist Park that will help you. Among cyclists, Mount Pancar is famous for its off road and down hill tracks. Every weekend or holiday, both professional and amateurs cyclists roll around trying their skills to conquer Mount Pancar. Once satisfied hit the tracks, cyclists can rest in the stall while enjoying coconut ice. 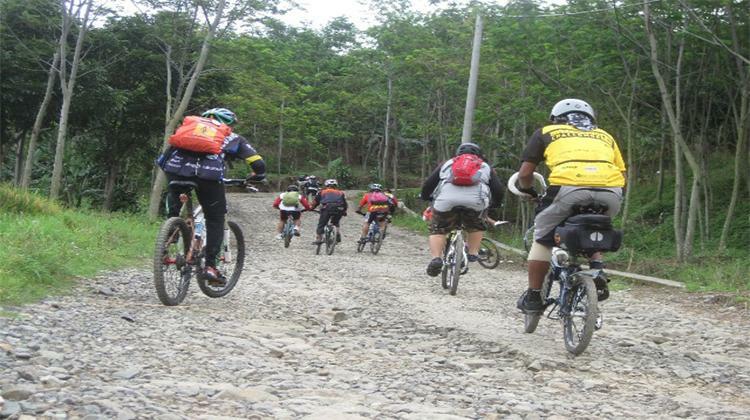 Thus, the combination of challenging tracks and scenic beauty make Mount Pancar a holy grail for every cyclist. The most common activity to do on the mountain is hiking. The serene atmosphere of Mount Pancar, cool weather and green scenery are certainly good for hiking with family or friends. Walking the paths, crossing the river, breathing in the scent of pine and enjoying the breeze will undoubtedly be a memorable experience. Hiking not only gives you sweat, it also refreshes your mind. Being in a nature far from the urban bustle is believed to make a person look at life with a new perspective. Not to mention the feeling of happiness and admiration for God’s greatness. 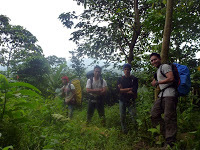 The beauty of Mount Pancar is not only suitable for family vacation, but also for outbound activities. There are many operators that offer outbound packages for both adults and children. The price is quite affordable, starting from Rp 50,000 per person. 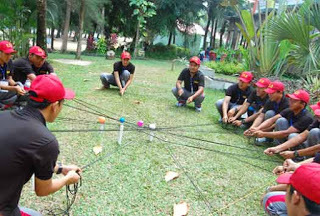 Some facilities in Mount Pancar Tourism Park for outbound activities include flying fox, spider web, tree house, and suspension bridge. Because outbound is an outdoor activity, it’s good to see the weather forecast before doing it. Hanging out with friends is fun, moreover hanging out under a pine tree. You can enjoy a cup of hot coffee or hot tea accompanied by fresh air and pine scent. In addition light meal such as instant noodle or fried banana is also perfect to fill your stomach. Mount Pancar’s Ameera Cafe gives you the opportunity to experience the sensation of hang out in nature. Celebrating a birthday or special occasion at Ameera Cafe will certainly be memorable. You can even make Ameera Cafe as an alternative to romantic restaurants in Bogor for a perfect date. It is common for taking prewedding photos in beautiful places. So no wonder many couples think Mount Pancar is ideal to immortalize their happiness. 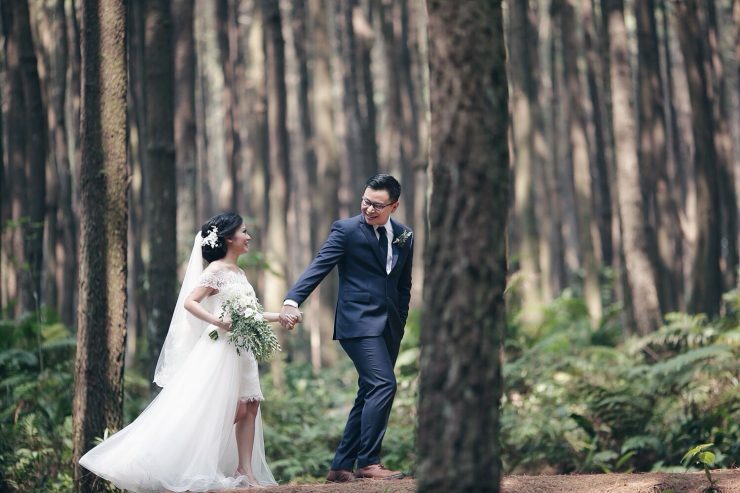 The atmosphere of pine forest certainly can bring the romantic aura of the couple. Since holding wedding reception in the open nature is quite popular, Mount Pancar’s pine forest can be the option. The beauty of pine forest will be the perfect theme. Plus the cool mountain air will be loved by guests. Mount Pancar, along with Cibodas botanical garden has charm that is hard to resist for most brides. Mount Pancar area is blessed with hot springs. Locals and businessmen take advantage of this potential by opening baths. Surely you can imagine how good soaking in hot water amid the cool mountain air is. Besides, the hot springs is believed to cure stiff muscles and skin diseases. Not to mention relaxing your mind. There are various types of hot springs in Mount Pancar, ranging from simple to luxurious. Some are open 24 hours. So going to hot springs can be one of cozy things to do in Bogor at night. Soaking in hot springs is for all ages. It’s really affordable. The admission starts from Rp 15,000. Mount Pancar is definitely instagramable. Therefore it becomes a favorite of young people. The towering pine tree will serve a nice background for every action you do in front of the camera. You can explore every corner of the pine forest to create amazing photos. Undeniably Mount Pancar’s pine forest provides another color for Indonesia’s rainforest. Glamping stands for glamorous camping. It means you do camping with five star luxury. It’s suitable for urban people who want to feel the sensation of spending the night in forest. All you have to do is just enjoy your time. A spacious tent is provided for you, complete with mattresses, pillows, blankets and electric as well. 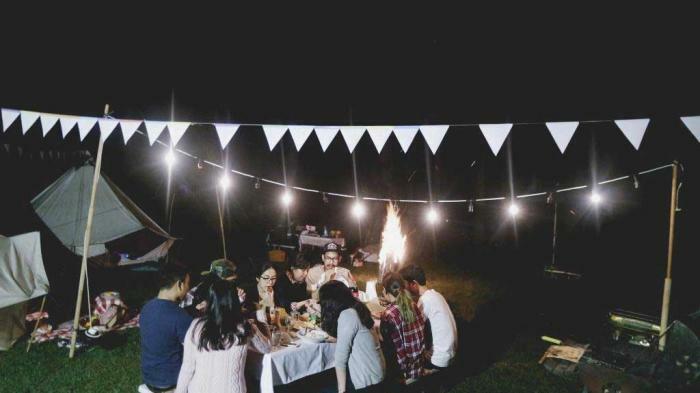 Dinner is served under the stars. There are officers who will light a bonfire to warm your night. Needless to say, glamping is the cool way to have fun with friends in Mount Pancar. It’s supposed to be one of things to do in Bogor as well. If you want to waste your time, what’s better than relaxing in a hammock. You can read books, check social media, or just daydreaming. Hammocks can also be a good photo object. Along with friends or family, you can pose in a colorful three-tiered hammock. Apparently posing in a hammock is a must when you spent your holiday in the mountains. 12. Visiting waterfall. Besides Mount Pancar’s waterfall, you should visit other waterfalls in Bogor as well. As you can see, there are various things to do in Mount Pancar. It’s the perfect place for vacation with family or friends. 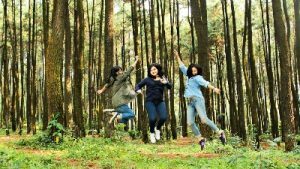 So come to Mount Pancar and enjoy the beauty of its pine forest.